Windows 10, the latest OS of the software giant got benefit of the Creators update and the share increased by 0.83 percent. It stands at 27.63 percent with second most used OS. Windows 7, the most successful OS of Microsoft went down a bit this month standing at 48.91 percent while previous share was 49.08 percent in June. Windows 8.1 had a slight increase, standing at 6.48 percent in July as compared to 6.40 in June. 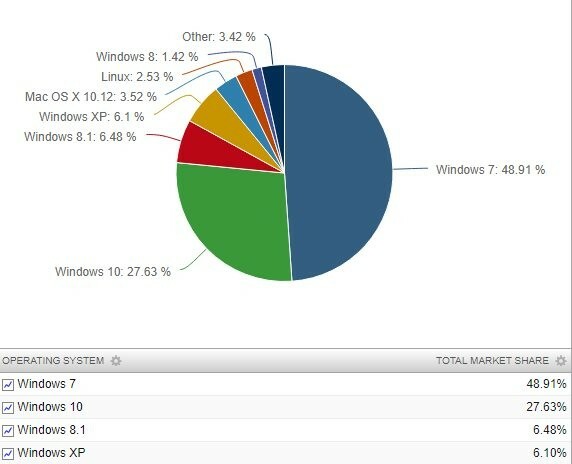 Windows XP is going down, as per the statistics say. Stragely it increased 1 percent last month, but it lost almost the same share in July. The OS had 6.1 percent share in July.